Guest Post by Martin Nicholson. Martin studied mathematics, engineering and electrical sciences at Cambridge University in the UK and graduated with a Masters degree in 1974. He has spent most of his working life as business owner and chief executive of a number of information technology companies in Australia. He has a strong interest in business and public affairs and is a keen observer of the climate change debate and the impact on energy. He is author of Energy in a Changing Climate, as well as an upcoming book on sustainable energy systems, and is the lead author of the 2011 paper in the journal Energy “How carbon pricing changes the relative competitiveness of low-carbon baseload generating technologies“. For an 11-page printable PDF version of this post, click here. The Australian Government Treasury modelling of a carbon price shows that Australia must purchase the benefits of overseas abatement efforts if it is to meet its emission reduction target by 2050. That is, foreign abatement will be required to supplement domestic abatement efforts. If more domestic abatement were available, fewer foreign credits would be needed. 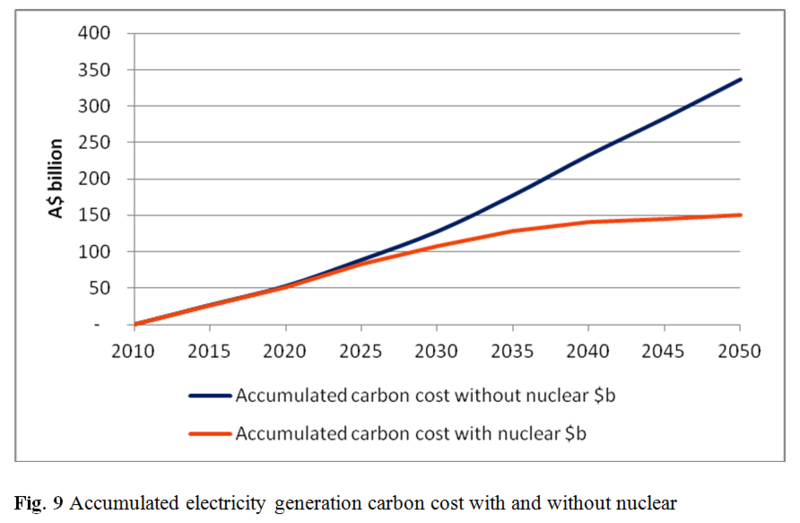 As an example, the analysis here shows that for the core Treasury policy scenario, Australia could save up to $185 billion net in abatement costs by 2050 if 25 gigawatts of nuclear generation capacity were built instead of building new fossil fuel generators. In July 2011, the Australian Government Treasury released its report titled Strong Growth, Low Pollution – Modelling A Carbon Price . Treasury modelled a range of scenarios which explored different environmental targets and design features in a carbon pricing scheme. To deliver Australia’s electricity supply over the period to 2050, the Treasury modelling assumes a mix of renewable and fossil fuel technologies. To conform to current government policy, the Treasury modelling excludes any contribution from nuclear power in Australia. Here we model a technology scenario for Australia without that imposed constraint. The main finding is that including nuclear power in the abatement portfolio would make Australia much less dependent on overseas abatement credit purchases and would save the economy up to $185 billion. For simplicity, we will consider the core policy scenario in the Treasury modelling where a carbon price is introduced in 2012, moving to a flexible price cap-and-trade scheme in 2015. The core policy assumes the world takes action to stabilise greenhouse gas concentration levels at around 550 ppm by around 2100. Although some will argue that this stabilised concentration level needs to be much lower, this core policy from Treasury provides a reasonably credible mid-range scenario, and provides for Australian emission reduction targets to be 5 per cent below 2000 levels by 2020 and 80 per cent below 2000 levels by 2050. For Australia to achieve these reduction targets, the Treasury modelling shows that in addition to domestic emission reductions, Australia will need to purchase abatement permits from overseas. 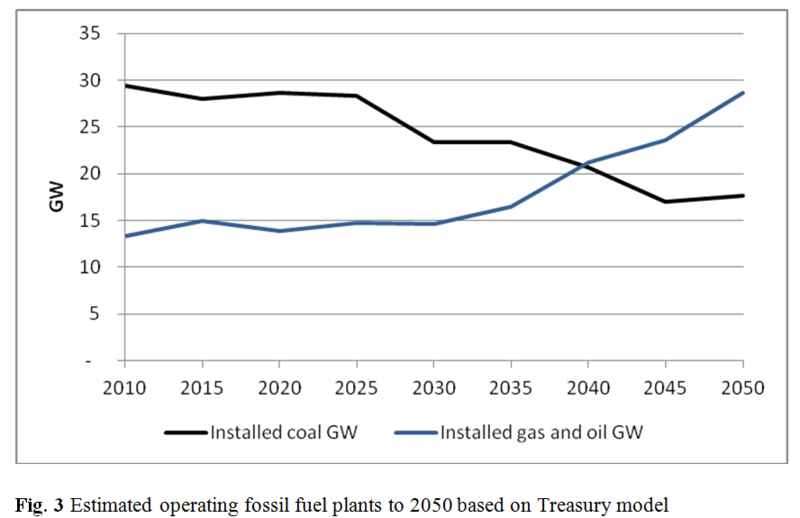 Our analysis of the Treasury modelling shows that it will be necessary to purchase a total of 9,100 Mt CO2-e of overseas permits by 2050 at a cost of $716 billion. The focus of this analysis is to consider whether some of this cost of purchasing overseas permits could be saved by investing some of that money in nuclear power to further reduce domestic emissions. Reducing domestic emissions negates the need for overseas permits, and is more easily verifiable as actual reductions. In the Treasury core policy scenario modelling, the greatest reductions in domestic emissions occur in the electricity sector. Coal-fired generation is reduced, more renewable energy and gas are used to generate electricity, and carbon capture and storage reduces emissions from coal and gas (after 2035). Despite the decline in coal-fired generation, this scenario still has 45 per cent of electricity coming from coal in 2030 and 26 per cent by 2050. In line with current government policy, nuclear power was specifically excluded from the Treasury modelling. This analysis aims to fill the resulting gap. Reference to “Charts” in this document refers to charts in the Treasury modelling report. Given the technology constraints, the Treasury modelling shows that domestic abatement alone cannot meet the emission reduction targets, making it necessary for Australian businesses to purchase permits from overseas to make up the shortfall (see Chart 5.2). Based on Chart 5.2 in the Treasury report, the need for internationally sourced abatement rises progressively from 2012 to 2050 (see Fig. 1). Between 2012 and 2050, Australian businesses will need to purchase overseas permits for 9,100 Mt CO2-e of emissions. At the same time the anticipated carbon price in the core policy shown in Chart 5.1 will also rise as shown in Fig. 1. 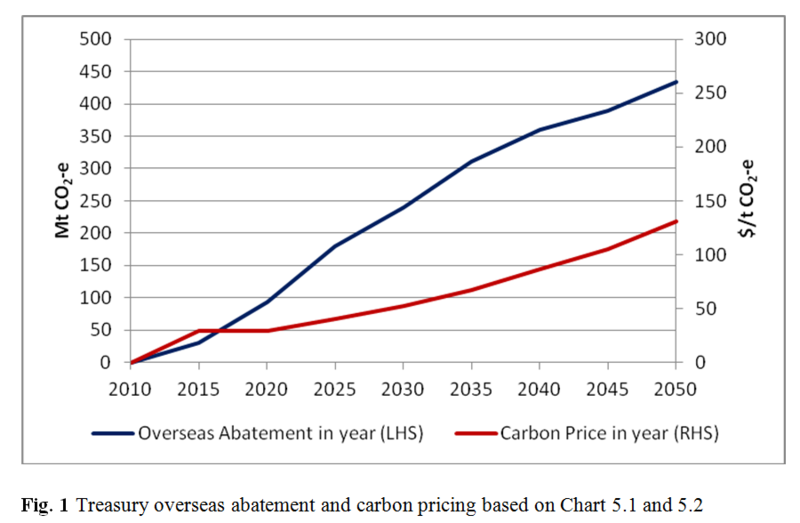 Calculating the total overseas abatement in each five year period and applying an average carbon price in each period yields a total cumulative permit cost of $716 billion by 2050 (see Fig. 7). Potentially, up to $716 billion (in terms of the cost of buying overseas permits) could therefore be saved by reducing domestic emissions further than proposed in the Treasury modelling. One source of reductions would be to replace all coal plants and some gas plants with nuclear plants. To assess the impact of this, it is necessary to estimate the installed capacity of coal and gas plants and the emissions from those plants in the Treasury core policy. This is not explicitly identified in their modelling. By analysing Chart 4.11 and Chart 5.17 it is possible to assess the total electricity demand used in the Treasury modelling for the core policy scenario (see Fig. 2). Treasury believes that electricity demand will fall relatively because of more efficient consumption choices and production processes after a carbon price is introduced. Chart 5.19 in the Treasury modelling shows the sources of electricity generation. For the purpose of this fossil fuel analysis, the core policy scenario prepared by consultants SKM MMA has been used. SKM MMA was chosen because it advocates a higher proportion of renewable energy than ROAM and therefore likely to deliver lower cost savings from replacing fossil fuels with nuclear power (in other words, the worse case of the two models). 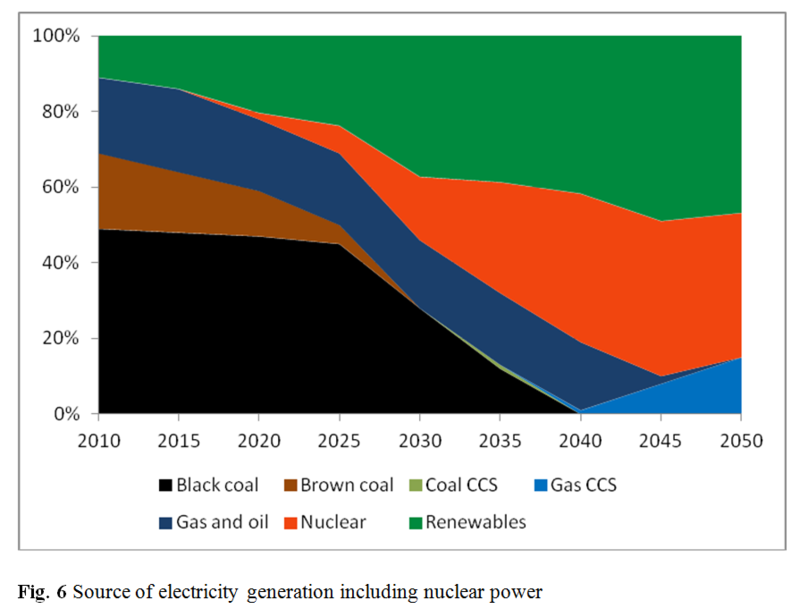 Applying the percentage of generation for coal and gas it is possible to assess the probable installed capacity of coal and gas plants up to 2050 assuming the capacity factor of future plants remains unchanged (see Fig. 3). The current installed coal capacity is about 29 GW . Our analysis shows that 23 GW of coal plants will still be operating in 2030 and 18 GW in 2050, at which point about 11 GW will be black coal with CCS and 7 GW will be black coal without CCS. All brown coal is phased out by 2040. The current installed gas and oil capacity is about 13 GW. Our analysis shows that 29 GW of gas and oil plants will be operating in 2050. Of these, about 10 GW will be gas with CCS. 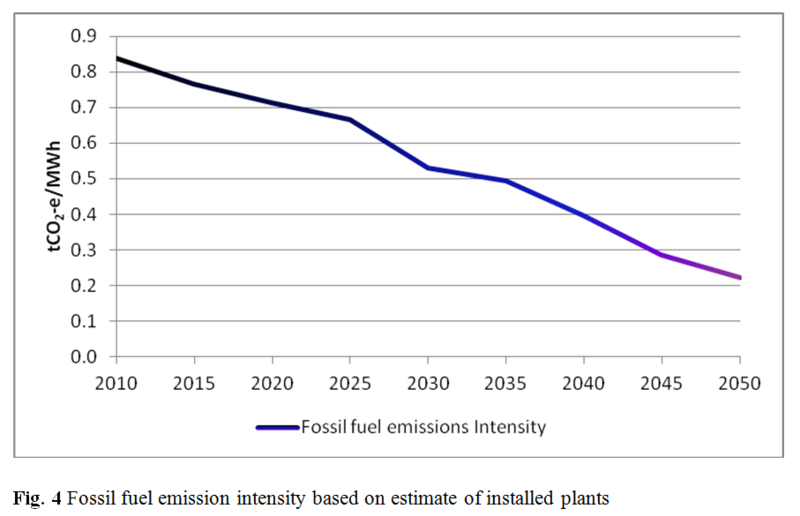 The average emissions intensity of the fossil fuel plants will progressively improve (see Fig. 4) as the brown coal plants are closed, some black coal plants are converted to CCS and more gas plants are built. This estimate of emissions based on the above analysis closely matches Chart 5.18 in the core policy Treasury modelling. Applying the emission intensity in t CO2-e/MWh to the fossil fuel generation in MWh up to 2050 gives the potential additional domestic abatement that might be possible from the electricity sector if all fossil fuel generation was eliminated. This additional domestic abatement comes to 5,700 Mt CO2-e or nearly two thirds of the overseas permits proposed in the Treasury modelling. Clearly it is not possible to replace all fossil fuels in the period as it would take time to build replacement generating plant. In the next section we consider replacing some of these fossil fuel plants with nuclear power by 2050. Under a scenario in which the first reactor comes on line in 2020 and Australia has in place a fleet of 25 reactors by 2050, it is clear that nuclear power could enhance Australia’s ability to meet its electricity needs from low-emission sources. By 2050 nuclear power could be delivering about one third of Australia’s electricity needs. It now seems timely to apply this suggested nuclear build to the Treasury core policy scenario. It so happens that 25 GW of nuclear plants (as proposed in UMPNER) will replace all the remaining coal plants in the core policy as well as some gas plants. 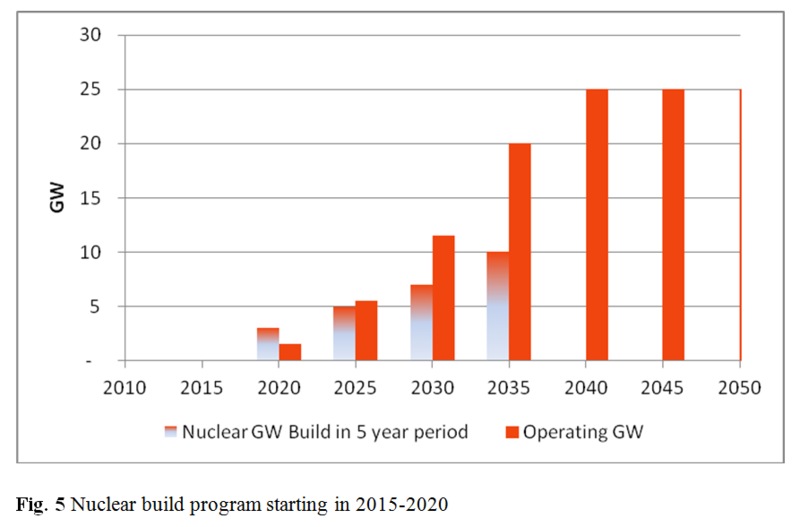 It will take several years to build 25 GW of nuclear plants. Fig. 5 charts one possible build program starting in 2015-2020 and completed by 2035 [The actual timetable and build size could (and almost certainly will) be varied]. The issue here is to consider the concept not to set out a firm strategy.). Assuming the plants are commissioned progressively, Fig. 5 also shows the anticipated operating capacity in each period. Fig. 6 takes the SKM MMA model in Chart 5.19 and adds the suggested nuclear build to the mix. In this analysis we have applied the nuclear plants to first replace brown coal plants, then black coal plants followed by coal with CCS and finally replacing some gas and oil plants. The amount of renewables has not been changed from the Treasury core policy. As the Treasury core policy has the 2050 electricity demand at around 380 TWh (UMPNER assumed the demand in 2050 would be 554 TWh), these nuclear plants would supply 38 per cent of the electricity by 2050. The net effect on emissions of using nuclear power is to reduce the need to purchase overseas permits by around 2,200 Mt at a cost of $185 billion, by 2050 (see Fig. 7). This reduction in domestic emissions also lowers the overall emission intensity of the national electricity sector to 26 kg/MWh by 2050 (see Fig. 8). 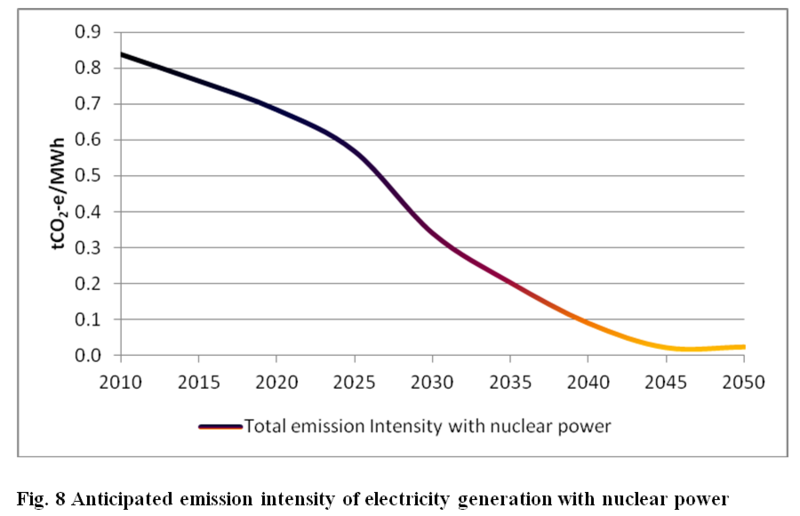 In absolute terms, emissions from electricity can be reduced by 95 per cent below 2000 level by 2050 using 25 GW of nuclear power in combination with the forecast growth of renewables already built into the core policy scenario [Any change to the nuclear build timetable or capacity might change the renewable component depending on the cost competitiveness of each option]. The Treasury core policy scenario without nuclear only reduces electricity emissions by 53 per cent below 2000 level. To our knowledge, only two comprehensive studies have been made into the cost of building nuclear plants in Australia, both by EPRI [Electric Power Research Institute]. The first, titled Review and Comparison of Recent Studies for Australian Electricity Generation Planning , was prepared in 2006 for the UMPNER report and compared and contrasted the results of contemporary studies examining the economic costs and other impacts of using nuclear, coal, natural gas and renewables forelectricity generation. The second, titled Australian Electricity Generation Technology Costs – Reference Case 2010  was prepared in 2010 for the Australian Government Department of Resources, Energy and Tourism. Section 3.3 of the 2006 EPRI report looked at the overnight cost of building various fossil fuel and nuclear plants from five separate studies. The overnight cost (usually expressed in dollars per kW) is the present value cost that would have to be paid as a lump sum up front to completely pay for the construction of the plant. Figure 3.3 in the 2006 EPRI report shows that nuclear overnight costs ranged from $1,750/kW to $3,000/kW. These costs were for countries that already used nuclear power and EPRI recommended in section 4.2.5.3 a scaling factor of 1.1 (10 per cent increase) for construction costs in Australia. This brings the range to $1,925/kW to $3,300/kW. EPRI’s 2010 report evaluated capital costs for Generation III reactors. Table 6-11 in the EPRI 2010 report shows the 2015 overnight cost as $5,742/kW and 2030 overnight cost as $4,876/kW. The IEA reported overnight costs for various projects in 13 OECD countries in its report Projected Costs of Generating Electricity 2010 Edition . Table 5.1 in this IEA report shows nuclear overnight costs ranged from $1,556/kW to $5,863/kW, depending on the country, with a median overnight cost of $4,102/kW. For another more recent comparison, South Korea is building a number of its third generation APR-1400 reactors. A recent report , has reported the overnight cost of APR-1400 at $2300/kW, compared with $2900/kW for EPR and $3580/kW for the GE Hitachi ABWR. Based on the EPRI and IEA reports, the overnight cost in Australia to build 25 GW of nuclear plant would be between $39 billion and $147 billion. Based on the costs reported from South Korea, this could be a narrower band, between $58 billion to $90 billion. These ranges conservatively assume no further cost reductions beyond the cited 2015 baseline cost. Building new nuclear plants will save the cost of building new coal CCS plants and reduce the cost of building some new gas plants between now and 2050. These are estimated in the Treasury report in section 5.4.3 (page 108) to cost $45-65 billion for the coal plants and $50-60 billion for the gas plants. Our modelling suggests that with a nuclear build, no new coal plants would be needed, saving $45-65 billion, and 45 per cent of the new gas plants would not be required, saving $20-29 billion. The potential total savings would be between $65 billion and $94 billion. In our modelled scenario, there will still be a $100 billion investment in renewables, with or without nuclear plants. The additional cost to build the nuclear plants might be as low as zero if the South Korean APR-1400 reactors were built in Australia at the quoted price ($2300/kW). Based on the highestcost in the EPRI and IEA reports ($5,863/kW), the additional cost to build nuclear plants, rather than coal and gas, might range from $53 billion to $82 billion. 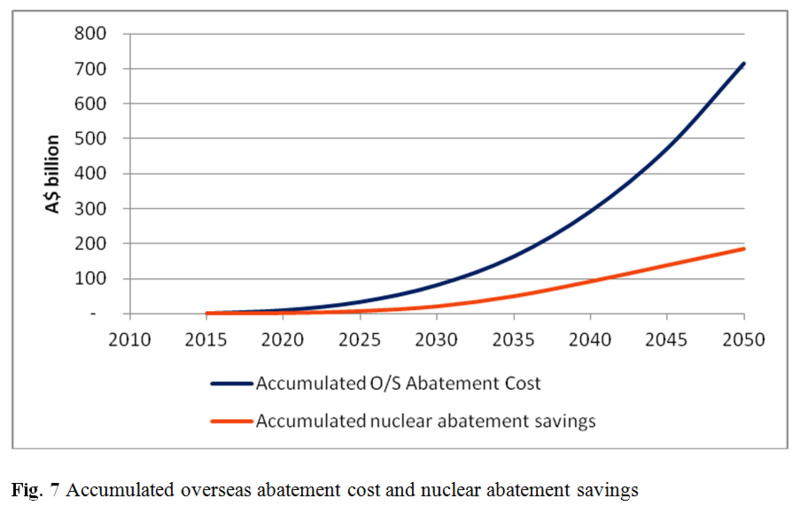 For a nuclear build cost between zero and $82 billion the country would save $185 billion in overseas abatement by 2050 and receive the ongoing benefit of an abatement cost saving of $10 billion a year beyond 2050 [For clarification, this is a net saving between $103 billion and $185 billion]. We discuss this in the next section. Operating and maintenance costs (O&M) and fuel costs vary between coal, gas and nuclear plants. The O&M costs tend to be higher for nuclear than fossil fuel plants, whereas fuel costs tend to be lower for nuclear plants. Based on Tables 10-4, 10-5 and 10-13 in the EPRI 2010 report, combining O&M and fuel, the total operating costs, excluding carbon cost, are $36/MWh for nuclear, $69/MWh for combined cycle gas, $23/MWh for black coal without CCS and $42/MWh for coal with CCS. This makes the total operating cost for nuclear less than gas and coal at any carbon price above $14/t CO2-e. The net effect on O&M and fuel costs of using nuclear power is a small increase over the period to 2050 of $7 billion. From 2050 on, there will be a net O&M and fuel cost saving from nuclear power of around $1 billion per year. This is because both CCS and gas (replaced by nuclear) have higher operating costs than nuclear. Without nuclear power, the Treasury core policy will require fossil-fuel electricity plants to pay a total carbon cost of $335 billion between 2012 and 2050. With many of these plants replaced with nuclear power, the total carbon cost to 2050 could be reduced to $150 billion (see Fig. 9). Beyond 2050, the abatement saving from using 25 GW of nuclear power is estimated at around $10 billion each year. Why Not Renewables to Replace Fossil Fuels? Chart 5.2 in the Treasury modelling shows the renewables share, by technology, of total generation. 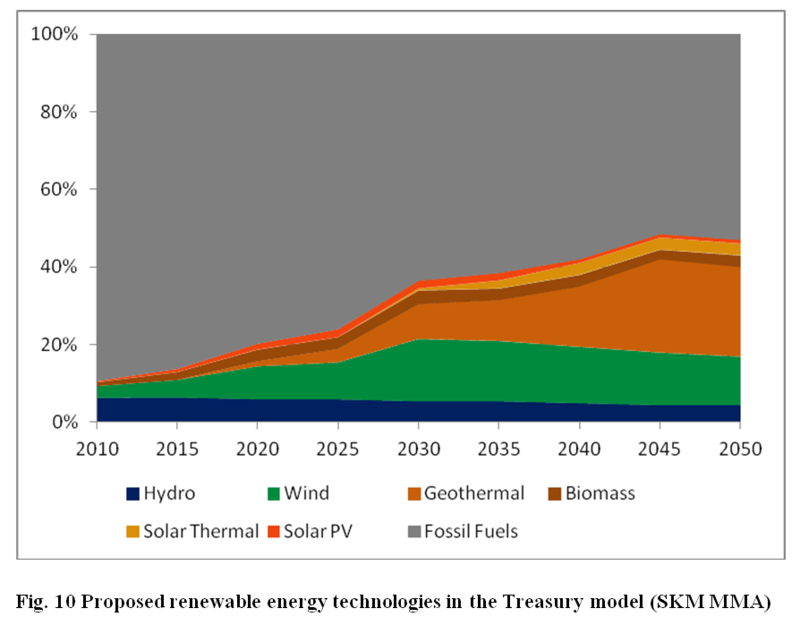 Again we have used the SKM MMA model as it proposes a higher rate of renewable energy in the mix (see Fig. 10). SKM MMA anticipates that 47 per cent of electricity will come from renewables in 2050, up from 11 per cent in 2010. The greatest growth is in geothermal (presumably engineered/enhanced geothermal systems, EGS) which will provide 23 per cent of our electricity by 2050, provided the technology achieves commercial deployment within the next few decades. To assess the ease with which the fossil fuels shown in Fig. 10 could be replaced with renewable energy we need to consider each technology separately. In Australia, both hydro and biomass are restrained in growth by resource availability. The flat growth of both shown in Fig. 10 supports this view. So we can assume neither of these technologies will replace more fossil fuels than already proposed. Because wind and solar are intermittent sources of energy they both either require energy storage or balancing generation from non-intermittent sources. That balancing is largely provided by fossil fuel plants (mainly gas) and some hydro today. Large-scale energy storage is currently very expensive . We may see technical breakthroughs over the next few decades that change this situation and might make wind and solar more competitive with less need for balancing generators, but this is far from certain. This leaves the one potentially scalable and non-intermittent source which is geothermal. In Australia this largely means EGS using man-made deep hydrothermal reservoirs rather than conventional geothermal systems using naturally occurring hot reservoirs. Conventionalgeothermal systems tend to be limited to a few volcanic regions around the world, such as Iceland, California and New Zealand. Australia has been developing EGS systems since the early 1980s with very limited success. Despite millions of dollars in investment, we are yet to see a functioning EGS electricity plant. SKM MMA is banking on this changing before 2020 with no certainty that it will ever be practical or cost effective. Given the technical risks associated with both EGS and energy storage it seems that Treasury was prudent in not modelling an all-renewables strategy by 2050. The nuclear solution for replacing fossil fuels does not involve the technical risks of EGS or large-scale energy storage. Producing electricity with nuclear power is proven technology widely used and accepted throughout the developed and developing world. There are, however, some political and social issues in Australia that would need to be resolved before nuclear is legitimised here. We hope that a quantitative understanding of the economic consequences might speeds up a resolution to these political and social issues. For an additional cost of between zero and $82 billion to add 25 GW of nuclear generators into the Treasury core policy, Australia could save up to $185 billion in overseas abatement cost by 2050 and reduce our emissions from electricity generation by 95 per cent below 2000 level by 2050. Interesting. More commets to follow. This is excellent. All bases covered. I wonder why Treasury didn’t do this analysis? I guess the answer is they are stuck with using the high cost of nuclear as stated by the EPRI report. I presume they haven’t recognised the nuclear option could be much cheaper if we were prepared to remove the impediments that make the EPRI estimate for nuclear in Australia so much more costly than nuclear in Korea, UAE and elsewhere. Excellent post. The role of offsets seems to have been a sleeper within the climate change community for a few years with only the odd dissenter, and might have made sense within a truly global system. The community is not going to be happy to discover they’re sending billions of dollars overseas in return for pieces of paper claiming that trees haven’t been chopped down, in a context where the world’s largest emitters lie outside of a global agreement. Putting some numbers to the offsets in relation to the purchase of “real” assets that provide tangible benefits is a valuable contribution. I read Larry Lohmann’s critique of offsets a few years ago when a global agreement seemed more plausible and thought he was just having a whinge, but re-reading post-Copenhagen, I see some wisdom in his critique. Martin, thanks. That is the analysis I needed to back up the obvious point I make in my presentations: that the only possible consequence of our arbitrary exclusion of nuclear will be to drive up the cost of our climate change response while driving down its efficacy. Renewable advocates, if they are honest in their climate concern, ought embrace your finding, as it maintains a whopping 47% of our electricity coming from their favoured sources by 2050. Another oft neglected consideration is that the rapidly growing developing world is going to need their own low cost abatement, rather than selling it to rich nations, if we are to succeed globally in addressing this problem. The sensible approach of nuclear deployment frees up this abatement. Great post, I will be drawing on it heavily. Reducing domestic emissions negates the need for overseas permits, and is more easily verifiable as actual reductions. A very important point worth emphasising. In line with current government policy, nuclear power was specifically excluded from the Treasury modelling. Another important point worth emphasising. Treasury believes that electricity demand will fall relatively because of more efficient consumption choices and production processes after a carbon price is introduced. I wonder how much of the assumed saving in electricity consumption would be achieved by shifting electricity intensive industries (and their jobs) out of Australia? This is what EU has done and the consequences to the EU economies are obvious to all. The greatest growth is in geothermal (presumably engineered/enhanced geothermal systems, EGS) which will provide 23 per cent of our electricity by 2050, provided the technology achieves commercial deployment within the next few decades. As an aside, this is one of Treasury’s many unrealistic and unjustifiable assumptions, given the world has made negligible progress in EGS geothermal in the past four decades. The focus of this analysis is to consider whether some of this cost of purchasing overseas permits could be saved by investing some of that money in nuclear power to further reduce domestic emissions. How much more cost could we save if we built more than 25 GW nuclear by 2050? Could you add a chart that shows savings versus capacity by 2050. In absolute terms, emissions from electricity can be reduced by 95 per cent below 2000 level by 2050 using 25 GW of nuclear power in combination with the forecast growth of renewables already built into the core policy scenario. I suspect what would happen in reality is the nuclear would be built instead of the renewables. So we wouldn’t reduce emissions by 95% but I expect the cost would be less. Can you say what the cost savings would be if we built 25 GW of nuclear by 2050 but less renewables (which is what I expect will really happen)? A chart would be good. Could you summarise for me what would have to be done to build 25 GW by 2050 at zero additional cost? In fairness to Treasury they had to come up with something quickly and probably put in some all-nighters. There’s no way serious money would ever go on foreign offsets when we need to build hospitals here. Something like $50m to Indonesia to protect the orangutan habitat would be sufficiently vague and noble sounding but not billions. I also doubt gas fired generation will grow that much. The leading experiment for gas with CCS at Peterhead in Scotland is going nowhere. Clearly they don’t really want gas for baseload in either Hunter Valley NSW or Latrobe Valley Vic. When/if the trucking industry switches en masse to CNG they will price gas too high for most stationary users, by 2020 I reckon. I see from Energy Bulletin that view in now being expressed in the US. Our power needs will have to come from guest workers on treadmills. In two months time Geodynamics’ 1MW plant will be online from the Habanero project for Innamincka township. A further 25MW will follow after 12 months of successful operation of the 1MW pilot. Having the analysis go through 2050 is nice. It seems illogical to believe we can continue to mine and burn coal without dire consequences in the future. Thanks for the analysis. According to Geodynamics, a financial investment decision will not be made on a 25 MW commercial demonstration plant until 2013. Given the nature of this sort of thing, targets could slip by lots. Might not ever happen. If they get there, that’s great, but it’s hardly something that can be depended on at this time and probably not for a decade at least – or maybe ever. Also runs off a diesel genny to start the 2nd hand 60Hz steam turbine generator (which is being recommissioned to run at 50Hz) & for backup power. See p6 of the doc, for some reason text selecting is disabled in the PDF. Is any of that important, so long as they do it? I think they’re demonstrating a closed loop EGS well not a brand-new turbine or whether or not a site like theirs needs a standby diesel set (it does). The ‘investment decision’ stuff is just standard listed company language. also in the doc ref’d in my previous comment, Geodynamics state in their timeline that the 25MW commercial demo plant (CDP) is expected early 2015, not in 12 months time after 1MW pilot, & that the construction of a transmission line to the NEM would be early 2018. are there any more updates on this timeline to substantiate your 12 months time claim for the 25MW CDP? or any more info regarding the appearance of transmission line to the NEM ? Would it be fair to argue that in this scenario the usage patterns of intermediate and peaking gas use do not change? The transmission line obviously occurs before any of that. it matters in terms of cost and location of supply/demand. I’m quite happy they are demonstrating tech feasibility of generating electricity, good for them. The question is will they ever scale it up & get it to the grid cost effectively? Its not exactly close to load centers. I think the 6500MW for 50 years will need some sort of transition plan, especially when I hear the carbon tax politicians talking about “children and grandchildren”. I see on page 12 of previous ref the general idea is to leverage Cooper Basin solar & gas resources. “Geodynamics proposed a Transmission Super Highway (TSH) connecting national grid nodes at Olympic Dam, northern Adelaide and western Brisbane via a hub within 100 Km of the Innamincka project site. So has anyone come up with a costed plan for all this including the transmission? And where are the details about that? “Large scale transmission infrastructure as envisaged in the TSH concept takes many years to develop. Even if the project were started in earnest today it would likely be at least ten years before it would be completed. So before they can come online to the NEM, if someone (not them obviously) started the TSH tomorrow, we can expect grid feed for the first 500MW by Oct 2021 in an ideal world. What would be the cost of that? The clear advantage of including nuclear is illustrated fro me by figure 6. If, sometime around 2030, renewables are not able to pick up their portion of the generation requirement, nuclear buld can be increased to cover more of the requirement for non-fossil. 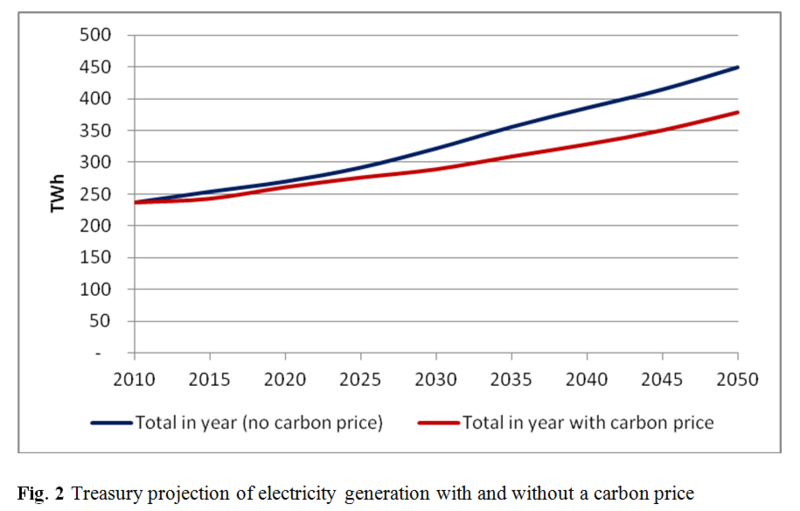 The other factor that should be included in achieving a low carbon generating infrastructure is that the demand should increase, back to the higher levels assumed in figure 2 “no carbon price”, or even higher if transport electricification is undertaken. according to this more recent article, Geodynamics have received $100million of taxpayer money. note: share price has gone up a couple of cents or so since this article (26-09-2011). Why would the whole TSH have to be finished to connect? Aren’t they simply making the point that if such infrastructure were planned properly, there are other potential (future) projects wishing to connect. (We maybe getting off topic here). @z”Why would the whole TSH have to be finished to connect?”etc. Geodynamics are the ones proposing it in their submission. Until they come up with a plan / document, well, who knows? I dont think this is off topic, as geothermal is mentioned in the post, and you brought it up in the comments. TSH is a key part of it becoming viable for Geodynamics et al. + treasury modelling includes geothermal, so what will it all cost and what are the timeframes? You might wish to review their 2011 audited financial reports. but nuclear power is not allowed. Why is nuclear power not allowed in Australia.??? @harrywr, did I miss something, or does that Geodynamics report only give one paragraph on future work program? Even that has a disclaimer paragraph following to say they don’t know exactly when it will happen. The proposed 2011/12 financial year work program will progress the Innamincka “Deeps” Project through activities focussed at the Habanero location. The first proposed major activity is the drilling of the Habanero 4 well that is expected to be completed during the financial year. The Habanero 4 well is the first step to reinstating flow at the project and progressing the commissioning of the 1 MWe Habanero Pilot Plant which remains Geodynamics major near term milestone. The proposed forward work program is a gated process with each stage dependent on achieving successful results from previous activity. As such the order and timing of future activities remains subject to ongoing review. The current appraisal program is focussed on acquiring the reservoir data and demonstrating the well capacity necessary to prove the commercial viability of EGS geothermal consistent with the objectives under our Renewable Energy Demonstration Program grant. Looking at the UNPNER study, there is a review of “external” costs (4.4.3) related to nuclear and other generation technologies (and impacts on LCOE and carbon abatement measures). One might also add into this category policy and regulatory supports that would be needed in Australia (safety, risk assessment, licensing, waste management and inspections, financing, insurance, nuclear security and international affairs, transportation, incident response capability and programs, pollution and radiation monitoring, and the like) in order to operate power plants on a reliable basis, secure public support and confidence, and provide greater certainty for private investment and risk taking (and with many of these costs rising in a post-Fukushima environment). It would be interesting to know how these “external” factors and requirements would impact your $185 billion cost advantage over a 40 year period (if Australia were to switch over it’s coal baseload capacity to nuclear), and how this might compare to other approaches (such as expanding R&D for geothermal, energy storage and transmission, “high” cost of carbon credits, rising future costs for fossil fuels, and more). One recent study compares CCS to EGS, and finds far fewer technical uncertainties, projected costs, environmental costs, lower investment risks, lower operational costs, and avoidance of fuel cost risk with EGS. It also suggests the “actor base” for R&D into EGS is much smaller and less developed than CCS (which is largely driven by established coal interests), and could potentially benefit a great deal from future research (and perhaps with fewer of the “external” costs of nuclear). Noting the potentially large (and renewable) resource base of geothermal, they ask the question: “Given the significant technical and economic uncertainties of CCS, and the comparatively large investments required over many years to resolve them, how should priorities on portfolio options be determined?” (2011:2029). It has been estimated that exploitation of energy from hot dry rocks, without the impermeable caprock and the natural water system, could create a supply of geothermal energy several times greater than that of geothermal fields now exploited. Some experiments in the USA involve fracturing hot rocks, injecting water into the lower part of the fractured area to use to generate electricity. Fractures have been successfully created by drilling into the rock and pumping water under pressure into a field zone of a well. Such hydrofracturing of the igneous rock is a method from secondary recovery technology for petroleum. However numerous problems remain. The fracture system may leak water, thereby preventing a build up of pressure and recovered heat and drilling in hot igneous rocks is difficult and costly. These and other potential problems must be solved in order to make hot-rock exploitation economically viable. By the year 2000, better answers to these technological problems will be known. Energy: Global Prospects 1985-2000, 1977, Workshop on Alternative Energy Strategies, page 222. Off topic please post on the OT. This applies to all those commenters pursuing this theme. In the US civilian nuclear policy and regulatory support is funded primarily by the licensee. As such it’s part of Operating and Maintenance costs. CCS or EGS? Some people are working on combining these concepts. Use CO2 as the working fluid. These are not in competition with nuclear power. You can buy a nuclear plant of up to 1600 MWe right now. Standard designs are available from various companies. All the world’s EGS capacity combined adds up to 5 MWe. A drop in a bucket would be a redundant proverb. Saying it is low risk is nonsense. It is high risk high return RD&D with a potential big payoff several decades from now. posted 12 October 2011 at 6:58 AM by Cyril R.
Thanks for just saying. Pity you didn’t add some reality. The Geodynamics EGS geothermal plant was just a few days away from coming on line in 2009. On 24 April 2009 the production well casing fractured near surface and masses of steam escaped for months. Much of the hot water contained in the rockmass escaped. The reality is that there are no commercially viable EGS plants anywhere in the world despite 40 years of trying in the USA, UK, Germany to name a few of the countries that have been trying. I expect we’ll continue pumping public funding into geothermal for a long time and we’ll have many demonstration and “pilot” plants like at Innamincka. But it will be a very long time, if ever, until it become commercially viable as a source of significant baseload power. EGS geothermal is likely to be another dud renewable like wind and solar. You are dodging the bleeding obvious. The plant being constructed is 1MW. They may or may not go to 25 MW. Itn is all pie in the sky stuff at this stage. It is decades away from producing anything useful at best. Thers is no indication it will be commercially viable. Past commenters who have continually made fly by assertions about renewables and continually avoided the issue are: Stephen Gloor (Ender), Bilb, Z@Z, EL, and some others. There is a pattern with the contributiosn of RE advocates – they ignore the facts and will not address the points of questions. They are a waste of time. Thye are not open to reason or analysis. The cost of the double circuit 500kV lines is about $2M/km. Fanned by 50 years of anti-nuclear scaremongering and disinformation by so called environmental NGO’s and their followers. Thank you for the excellent injection of reality with your quote from 1977. As you point out, the reality has not changed in the intervening 34 years. You qoute does not emphaise what is the most serious concern about EGS – channeling of water through the fractures from injection well to production well. To extract heat from the rockmass the water flowing from the injection wells to the production wells needs to flow across the full surface of the rockmass fractures. To be most effective at extracting the heat for the rock the water should flow equally over all the fracture surfaces. But this is not what happens. It finds the easiest path through the rock mass and travels in “channels”. So it does not extract the heat that is theoretically available. Furthermore, the low folw areas plugh up over time with mineral deposits. This further reduces the efficency of the system. When you see statement slike 6500 MW for 50 years, you can dismiss that as complete nonsense. This sums up the situation very well. However, I agree it is very high risk but dispute there is a potential for high return. I’d be very sceptical about the “high return” bit. I’s suggest there is negligible possibility of a high return because of the geotechnical limitations mentioned in my previous comment. Please continue the conversation on Geodynamics on the Open Thread. It is off topic here. I have let stand all previous comments on this theme as I have only just logged on since yesterday afternoon. As per BNC policy, further comments on this topic will be deleted and you will be asked to re-post. That AEMO report, dated November 2009, is more recent and more authoritative than the source I used for the 2M/km for 500 kV figure I used for transmisison costs in my October 2009 paper. As previously advised, please (re)post this is the Open Thread before I delete it this evening. Off topic here. @Peter Lang- I suspect Treasury’s decision to not consider nuclear power had more to do with politics than financial considerations. On the issue of possibly building more nuclear plant to replace renewables, I have deliberately avoided that issue as it could distract from the main purpose of my paper – which is to get consideration for the concept of using nuclear power to reduce abatement cost. Once we get people talking about changing the nuclear mix or the timetable the battle is won. We can then start to model the optimal nuclear mix and timing. ”Could you summarise for me what would have to be done to build 25 GW by 2050 at zero additional cost”? The zero additional cost option occurs if the nuclear plants can be built for $65 billion – $2,600/kW – close to the price quoted from South Korea. The $65 billion comes from not building any new coal plants with CCS and reducing the gas built by 45%. In my model, gas usage is reduced by 45%. It’s not clear from the Treasury modelling the anticipated mix between baseload gas and load balancing gas. How the remaining gas will be used will depend on the load balancing needed and the cost effectiveness of using nuclear plants for load balancing. @Joffan – I agree with both your points. As I said above to Peter Lang, the primary issue is to get the concept considered seriously. The important issues of total demand and nuclear mix are still second order issues. @EL – Policy and Regulatory Supports are important issues that would need to be costed before any firm nuclear plan should proceed. EPRI (2006) largely included these costs in construction which was loaded 10% in Australia. Even if all this loading was for regulatory issues it would still be well within the overnight construction cost range used in my analysis. Where do you get this number? MIT independent technical panel estimates EGS resource potential from 3-10km depth in US at 13,000 zettajoules (200 ZJ extractable and expandable to 2,000 ZJ with technical improvements). 2008 DOE report raises this number by 1000 zettajoules, and suggests mid-range development potential of 20%, or 28,000 times US annual primary energy use in 2005 (of 100 EJ). Thank you. I understand and accpet your reasons for not considering, at this time, the option of varying the proportion of nuclear and renewables. OK. Got that bit. Now for the important bit (if we are serious about trying to find realistic solutions); what would we have to do to get nuclear in Australia for around $2,600/kW? Latrobe will be weaned off brown coal well before this scenario is played out. Where the gas will come from in SE Australia is unclear, given that NG resources are on track for depletion within a decade. One presumes that the plan is for coal seam methane to fill the gap, in both Latrobe (Vic.) and Hunter Valley (NSW). This is a beautifully argued and balanced piece from Martin. By adopting as many as possible of the arguments of the current plan, he has focussed more sharply on the enormous national indebtedness that avoidance of nuclear power represents. 1. Net savings to Australia of between $102B and $185B during the study period. 2. Additional savings annually therafter. 3. Reduced technical risk associated with unproved technologies including CCS, EGS. 4. Reduced capital costs for transmission system upgrades which are essential for harvesting of diffuse wind and solar. 1. Potential additional future nuclear penetration depending on commercial experience gained within the initial decades. 2. Reduced exposure to commercial risks attached to importing foreign carbon abatement certificates which, while modelled to cost more than $100/t abated CO2-e by 2050, may in fact cost much more than that if supply is severely constrained, eg by societal collapse in originating countries. 3. Of greatest merit is the prospect that Australia will not rely on the efforts of the underdeveloped nations in order to retain its highly developed lifestyle and to balance its carbon pollution books. Such reliance is, at core, morally repugnant. With the money saved and skills developed, Australia might choose to offer foreign aid to the underdeveloped nations, to hasten their own access to carbon-free nuclear power. That would be a far better outcome. the only possible consequence of our arbitrary exclusion of nuclear will be to drive up the cost of our climate change response while driving down its efficacy. Even at the highest modelled additional cost of $82 billion (an average of $2.1 billion per year through 2050), we’d save over $100 billion dollars in abatement. And actually deal directly with our own emissions. Flies in the face of the anti-nuke rhetoric of nuclear not being economically viable. OK – thank you, that’s what I thought. I think Nuclear advocates ought to stop claiming that a renewable plan is a “gas plan” while here we have evidence that a nuclear plan is also a “gas plan” in the very same way. Not at all. Gas is needed to back up renewables because of their intermittency. This is certainly not the case with nuclear plants because nuclear power plants are not ‘intermittent’ in the same way. They have scheduled outages, an entirely different matter, and the choice of whether or not to use nuclear plants to load-follow is exactly that- a choice. Spin it anyway you like; pending some breakthrough in economic load following, NPPs use gas for peaking and outage backup. Renewables use gas to fill the shortfalls and/or backup. The question is the quantum of gas use between the alternatives. With nuclear power you have great range of choice in how to deploy it. With renewables, the choice basically boils down to how much money the natural gas industry decides to spend on renewable window dressing to justify their natgas build-out. There is also good reason to think that the price of natgas will skyrocket within a few years, and things are going to look very different then. SOme utilites in the USA wish to limit their exposure to the natgas market by building some NPPs; maybe even in Texas. In the US nuclear operator Exelon seems to think that piped gas will stay around $4 per GJ. However the Japanese recently paid $10 per GJ in the form of LNG. On a fuel taxed diesel equivalent basis CNG should sell for $43 a GJ. You don’t seem to be able to grasp the most basic concepts. What Martin has done is to take the Treasury model, which assumes 45% renewables in 2050, and replace all the coal and some of the gas – but not all by 2050. The job is not complete. While there is renewables in the system we need gas back up. Correct. As France demonstrates, very little fossil fuel generation is needed to back up for nuclear. Conversely, as all countries show, solar and wind power need to fossil fuels to back up for nearly 100% of capacity and around 70% to 80% of their energy output. Furthermore, and most important, the renewable energy option costs around five to ten times as much as the nuclear option. Z@Z, you don’t like the cost comparisons bit do you? EL- you obviously haven’t read my previous directive to move to the Open Thread with this topic. Others have done so already. You have until this evening to re-post before deletion on this thread. 60 responses in 10 hours must be close to a record for BNC. This is an indication of what an excellent paper this is. PL – I doubt it is a record. I expect the response rate was greater during the Fukushima crisis. BNC had over 1 million hits in less than a week and I sometimes had to read back over more than a dozen pages of comments left overnight. Sorry – I meant to say that I agree regarding the excellence of the paper by MN. If only it could be published in the mass media and if only it could be presented to those in government it could be a “game-changer”. MS Perps. I agree. I forgot about that period. Thank you Ms Perps. The plan is to publish it to the mass media once this group has helped get any gremlins out of the analysis. So bring on any concerns anyone has about the analysis. Sometimes it is difficult to see the wood for the trees when you are too close. I am less concerned about the product mix for reasons I have already raised. More about any flaws in the logic or the arithmetic. We’re not talking about France. “It’s a gas plan” is a common retort we see from the anti-renewables crowd. Under this proposal, in Australia, with a fleet of 25 NPPs, there is still a huge use of natural gas. Here you replace fossil baseload with NPPs, leaving our intermediate and peak demand serviced by…..gas. The accusation so often leveled at proponents of a “suite” approach of renewables can be aimed squarely here too; this is a plan for gas. It’s the For an additional cost of between zero and $82 billion I’d like to focus on. My reason is as follows. If the additional cost is zero, or near zero, then gaining community support should be easier, roll out will be faster; and replacement of coal and gas for electricity generation, gas for heating and oil for some transport will be faster. Therefore, Australia will cut its emissions faster than if the cost is near the high end of the range. Furthermore, if Australia can implement low-cost, low-emisisons electricity generation, then we’ll be competitive in offering consulting and skills transfer to developing countries. That would be the best thing we could do to cut world emissions. That would be a far more important achievement than simply building high cost nuclear in Australia. Therefore, we should focus on what Australia would need to do to allow nuclear to be built at near the low end of the coat range rather than the high end. At the moment the EPRI report (following the instructions and Terms of Reference provided by the government) has estimated costs for nuclear in Australia at the high end of the cost range and near the current US cost for nuclear. What would we have to do to avoid adopting the US type of regime and instead build them and operate tham near the low end of the clst range? What assumptions are generally agreed to start the NREL calculator for an Australian NPP? We have our own, but I don’t want to have that a subject of debate for the moment. Remember how there is 100 billion dollars of renewables investment in this model too? Wonder what a lot of that gas will be for…? You ask what assumptions to imput to the NREL calculatior. I’d suggest using the values in either the ACIL-Tasman (2000) or the EPRI (2010) reports. Both provide the figures you need, but you do noeed to remain consistent throughout. A word of caution, the NREL calculator will not give you the same results as these reports provide. The EPRI report in particluar, gives a much higher LCOE than the NREL calculator calculates. BTW, I listed all the figures you need (from those two reports) for solar thermal, nuclear, OCGT and CCGT in a cpomment addressed to you/amd or EL on a previous thread. You asked for suggestions and comments to improve the paper. If you can show that there is a reasonable prospect that the cost would be near the ‘zero-additional-cost’ end rather than the high end of the range, I’d expect there would be faster and broader acceptance and faster adoption. However, to do so, you’d need to explain how nuclear in Australia could avoid following the high cost route that has become embedded in the USA and EU. This authoritative presentation http://www.exeloncorp.com/assets/newsroom/speeches/docs/spch_Rowe_ANS_110815.pdf suggests the cost of nuclear has increased in the USA in the past 2 years such that the CO2 cost has increased from about $40/t to $100/t to make nuclear viable in USA now. We’re doing a paper on the effect of introducing much higher than average NEM baseload compared to (potentially) similar/cheaper cost intermediate/peaking via CSP w/storage. I’m sure everyone will have kittens. No one will have kittens if the assumptions and inouts are reasonable and justifiable. But there are thousands of nonsense papers by renewable energy adocates and wishful thinkers. There would be no value in adding to that pile of rubbish. I am a retired mechanical engineer w/ my entire professional lifetime spent in aerospace (gas turbines). While I studied nuclear in college I am basically just on the outskirts of understanding what is discussed on this blog. When I read your paper I got bogged down in all the minutia of the assumptions that went in the analysis. I was beginning to wonder if you were going to give a simple summary and of course you did an excellent conclusion at the end of the paper. I would suggest that you cut the length of the discussion about the assumptions in at least half and hammer away on the conclusion as that is all then general public will remember anyway. Thx for the interesting read. You need to take more care on important data like this. I’d suggest a revision of your study is in order. The cost of running a current black carbon coal plant in the US is closer to $40 a mwh. Just look up current fuel costs at Bloomberg energy instead of relying on a notoriously biased data from sources like the EPRI . The idea the continuous trainloads of coal loading into a old labour intensive coal plant results in lower O&M than a modern automated nuke plant is simply absurd. More accurate data can be found below giving coal at $30.6/ Mwh and nuclear at 21.4 for ancient 50’s designed machines including NRC assessments for paper only fantasies like waste disposal (fuel for Gen IV reactors, insurance (never used), and decomm (nuke sites will always be nuke sites) and ancient costly centrifuge enrichment. With modern laser enrichment, O&M systems, fuel efficient reactors and elimination of fantasy regulatory assessments that cost would be half in modern reactors. Note that in enlightened jurisdictions that use public power like the TVA or Bonneville in the US or Hydro Quebec in Canada, the discount rate is less than 5% making O&M/fuel costs the largest part of the levelized cost of using nuclear reactors. I think one of the excellent points about this paper is that the assumptions are laid out and supported by authoritative sources. I think giving the range from high to low values is excellent because it covers all bases and can avoid a lot of the distracting argument that is commonly applied to such a paper as a means to try to undermine its credibility. Therefore, I strongly support the paper including all the assumptions and references as it is presented here. The problem with much of the literature, especially the literature advocating renewables, is that the assumptions are not laid out and, where they are, they are not supported by authoritative sources. I’d suggest Martin write a separate op-ed focusing on explaining the conclusions. That would solve your need and publishing the paper basically ‘as is’ would solve my need for a paper that clearly explains the assumptions, the ranges and supports them with authoritative references. Martin commonly writes an Op-Ed. I would also urge Martin to address my question up-thread, but perhaps in a separate article. I’d also urge others to get involved in discussing the question I raise. If BNCers are genuinely concerned about finding a practicable solution to cutting world CO2 emissions, there should be no reason to avoid discussing it. Why do you say EPRI is “notoriously biased”? I understand EPRI is considered to be one of the most authoritative sources by industry for the sort of comparitive studies they do. I, therefore, trust EPRI more than I trust many other self serving sources such as NREL NEI, etc. ACIL-Tasman has similar credibility for its studies for Australia. I doubt that 5% is a realistic discount rate. Certainly not for Australia. The presentation by the CEO of Exelon http://www.exeloncorp.com/assets/newsroom/speeches/docs/spch_Rowe_ANS_110815.pdf shows that the industry insider’s perspective supports the figures EPRI has estimated. So I suspect, EPRI and Exelon CEO are probably correct given the current political, and regulatory environments – hence the sovereign risk and investor risk environment – in USA and Australia. What can we do about removing the impediments that are making nuclear so costly? If there is no answer to this question, it would seem people are unwilling to look into it or they believe it is too hard and should not be looked into. Delivered coal prices in the US have substantial regional variation from $1/MMbtu to $4/MMBtu. Also a theoretical mine-mouth coal fired plant will have different costs then an actual plant. sort of like the operation feeding the coal plant next to Lake Powell!! GS I watched a Discovery Channel show last night on building a bridge across that same Colorado R. All the workers used centimetres for measurement. So how come the US still uses btu’s for energy? Martin, the purchase of overseas credits will be conducted by individual liable businesses purchasing from a range of sources at the lowest cost, in which there is little incentive for the purchaser to assess their “true value” other than being judged legal by the authorities. I realise that the paper is not meant as a critique of offsets, but if the paper is intended for public distribution, would there be value in briefly describing what likely form overseas permits might take and what “real value”, if any, that businesses are actually buying, and what this means for the community? If the foreign credits have no intrinsic merit then to paraphrase Richard Feynman we will fool ourselves but we won’t fool Mother Nature. Most claimed offsets fail to meet simple criteria like globally new, permanent, verifiable and putting net emissions below a horizontal baseline. Whether it is the government or emitters their stakeholders should be justifiably angry if ‘dead’ money goes overseas. Hopefully by 2015 there will be a reality check. I believe CO2 from Australian mined coal and LNG is now over 800 Mtpa though I’ll check using the latest stats and multipliers. Meanwhile don’t forget to switch off that unnecessary hall light coz we’ve got to save 159 Mt by 2020. Off topic. Please move to the Open Thread. Thanks for the bad news there, John Newlands. As usual economic interests trump ecology. Australia really needs to get serious about nuclear. Not only do we have a moral imperative to do so (to reduce our CO2 emissions), we have an incentive of spending an additional $53 billion to $82 billion over 39 years to save over $100 billion net, and not impact on wildlife or spew pollution into the atmosphere. Peter Lang — I’ll offer suggestions on Open Thread 18 as this is going off topic on this thread. places like Indonesia isn’t JUST to protect carbon, it is to provide development funds that would otherwise come from exploiting things like tropical forests. There are two issues. How to protect forests and how to ensure that as Indonesia expands its energy infrastructure it does so in a climate friendly way. Even if Indonesia doesn’t protect her forests, we still don’t want her building dirty power stations. save what’s left of those forests. It would be much easier to clear the cattle out of S.E Queensland and let that reforest … not that it would sequester as much carbon. Wrong approach. Won’t work. Developing countries need trade (and economically rational devlopment), not aid. It’s like the difference between giving a person a real job and a future or giving them the dole. Correct approach is for western democracies to allow nuclear to be cheaper than coal. If discussion about the economics of nuclear is off-topic, what is on topic? Although BNC comments policy states BNC wants to address solutions to cut CO2 emissions, tt seems we are only allowed to discuss solutions that agree with the (deleted personal inference of motives/beliefs) the moderator. BNC is not all about Peter Lang and his opinions. Your deleted comment was in answer to others who had been advised to move to the Open Thread by myself and DBB who was attempting to answer you and saw you were off-topic. They had done so – you chose not to comply suggesting BNC was banishing your opinion to the “sandpit”. Your comment was not about the economics of nuclear power as discussed in this thread, rather about your pet subject – the Carbon Tax. Keep these comments to the Carbon Tax thread or the Open Thread and they should survive. The commenter you refer to was asked to move to the Open Thread where rules are more relaxed regarding unsubstantiated personal opinion. I gave two warnings to move and this was complied with by the others. I follow the protocol of allowing the first one or two off topic comments to stand while the situation is resolved. Further complaints from you posted on this topic, on this thread will be deleted and you may again be put on moderation. Peter: If Indonesia can trade its way up, without trashing its forests, then that’s fine by me, but the world’s current advanced economies have generally got where they are by trashing somebodies natural resources … frequently not their own. My point is simply that somehow Indonesia, Brazil, the Congo, etc have to power up without razing their forests and I can’t see how that can happen without a wealth transfer and Martin’s paper is about saving money … largely by preventing wealth transfer. I’m quite happy to “waste” money buying genuine credits. On a global scale no carbon flows change, merely the exchange of money. Perhaps it could be backdated for 100 years. I’d liken it to blackmail ‘pay us or the forest gets it’. Most other times blackmail is frowned upon. Given that ANU forestry researchers think Tassie forests store as much or more carbon per hectare than tropical forests it could be regarded as a form of cultural cringe. Mostly I think the overseas angle helps avoid tough scrutiny. I’d call it the overseas black hole. Once coal exports and foreign carbon credits pass the event horizon all knowledge is lost and tough questions cannot be asked. Agree with Geoff that some transfer of wealth to developing countries has merit, but is a carbon tax the best way to do that? Will the poor really be the recipients of the wealth transfer? Why not just increase targeted funding for international aid with measurable outcomes and responsibilities, rather than who has the largest forestry areas or other opportunities? Australia’s international aid program is improving the lives of millions of people in developing countries. Australia is working with the governments and people of developing countries to deliver aid where it is most needed and most effective. The program also responds quickly to help vulnerable populations when disasters strike. Australia is unique in the proposed use of overseas credits – the EU has much firmer limitations. Andrew Macintosh brought attention to the difficulty Australia has had in defining baselines and limiting deforestation, despite being an advanced country with a strong bureaucracy and advanced satellite measurement. If an advanced sovereign country can’t even define an accurate baseline, what chance is there for an international system that includes developing countries? Carbon credits have not worked and are not likely to. Only carbon mitigation possible is by producing power by non-carbon sources. Nuclear is cheaper than all non-carbon sources. It has potential of becoming cheaper than coal in due course. China currently uses half the world’s coal and is starting with nuclear generation. India has comparable population and is much behind but likely to catch up in energy use. Purely from carbon mitigation viewpoint, Australia should sell India uranium and not coal. India also has cheapest per kW nuclear plants. Australia not selling uranium to India does and will continue to mean buying it from other sources. Security of supply from Australia will mean quicker development of nuclear compared to thermal power. Australia with maximum reserves of uranium must use it at home to encourage non-carbon power production. Coal can be gasified in situ and the gas can be used as a value added fuel, in addition to reducing the coal mining problems. – there will be outrage at buying foreign offsets. I believe the correct approach is to impose a CO2 cap but to disallow most offsets and terminate special industry deals. At the same time make nuclear legal and remove renewable output targets leaving just the CO2 target. I believe this is essentially the position of Garnaut and the Productivity Commission. Other public agencies have dutifully followed the script. Hopefully by 2015 or so public opinion will shift this way. SKM MMA anticipates that 47 per cent of electricity will come from renewables in 2050, up from 11  per cent in 2010. This is interesting. It shows Treasury expects, by 2050, 47% of our electricity will be generated by renewables and 53% by fossil fuels, most of which will have carbon capture and storage. However, the renewables’ share of electricity generation has increased by just 1 percentage point in the past 5 years and non-hydro renewables currently provide just 3% of our electricity (of which wind is 2% and solar is 0.1%). To achieve a 20% share by 2020 and 46% share by 2050 would seem highly unlikely. To base government policy on such a wish seems very risky – incompetent. I notice that the coal industry is not stepping forward to provide finance to keep the thing afloat. This is the third flagship CCS cancellation in the last month or so. UK cancelled their flagship program, and this is the second recent announcement of cancellation of Qld government funding for CCS. It seems that Treasuries modelling and government policy is dependent on about 80% of our electricity being supplied by technologies that have virtually no chance of being viable. Furthermore, the purchase of emissions permits from developing countries, when there is little chance of an economically efficient, international trading scheme eventuating for a very long time, seems just as incompetent. There is virtually no chance of the public accepting any of this. It might take them a while to realise what is happening, but their awareness is already growing. The fact is that the world is not moving to implement an emissions trading scheme. Canada, USA, Japan, Russia, China and India have all made it clear they have no intention of going this route. They are taking direct action. We must too. And now Europe is back-pedalling too. There is no point implementing a scheme that depends on international trade in permits when there will be no international scheme that can allow the trade to work. Its just no going to be accepted by the public. All my substantiation for all these statements are on the “Alternative to Carbon Pricing” thread, and the “Carbon Tax in Australia 2011” thread. (My)fundamental point (which) cannot be ignored, is that the Australian CO2 Tax and ETS will not cut world emissions, will not change the climate but will severely damage our economy. (This is) a policy that (I believe) can deliver no benefits but will cause significant harm to people (or at least it will reduce the rate that conditions can improve). Inflammatory comments edited out – substance stands. This is your personal opinion – please make that clear as did JN in the comment to which you refer. As you are both expressing personal opinions, this dialogue is veering into Open Thread territory. Peter I have to disagree on Australia’s influence on world carbon flows. CO2 from our domestic and exported fossil fuels accounts for ~1.5 Gt of about 30 Gt of global man made CO2. However Australia has only 0.3% of world population. Therefore there will be a leveraged effect if Australia makes a serious effort to decarbonise. Secondly Australia could form an alliance with Europe and some Nordic countries to make life difficult for the nations you mention. For example an arbitrary 20% carbon tariff on all their imported goods. The US wouldn’t like it if a lot of its exports were slapped with a carbon tariff, Could the rest of the world retaliate? Not for long as we are the only country with 8 or 9 coal ports, a third of the easily mined uranium and half a dozen LNG trains under construction.. Yes it is Australia’s obligation to do something. We can and we should. I have slightly edited this comment to avoid confrontation developing. This line of discussion, which is based on the personal opinions of you and PL should be on the Open Thread. I think the important issue here is that the ZeroGen project has collapsed rather than anything to do with the carbon tax. The Treasury plan calls for CCS to start mid-2030. That gives the CCS industry another 20 years to develop complete cost effective and safe CCS systems. Given that the industry knows how to do the capture process, that part will probably not be the problem. The difficulties will be around the storage process and the confidence of the jittery environmentalists to come to terms with it. CSG might look like a picnic once they get serious about storing millions of tonnes of CO2 – somewhere – even if it turns out to be deep in the oceans. It’s probably too early to sound the death knell of CCS but it has a bit of the feel of the engineered geothermal systems (hot rocks) industry. Long on promised future, but short on commercial delivery. CCS is DOA for two reasons. 1) CCS makes coal power more expensive than nuclear. 2) Without government guarantees to hold utilities harmless for water contamination, utilities have said they will not implement CCS. The US government recommendations to President OBama specifically stated that the government should not provide guarantees to hold utilties harmless. Therefore the technology is considered as too risky. Gene, in Australia, our government doesn’t care that coal with CCS is more expensive than nuclear. Nuclear is banned. Solar thermal is even more expensive but it doesn’t stop countries like the US, Spain and some in Australia embracing it as the future of baseload power generation. But if you are correct and it is DOA in the US then it will be that much harder to implement in Australia. We tend to be followers not leaders. In the US the decision making process for what kind of generation to build is highly decentralized into individual companies, There are a whole lot of different companies in the US with different ideas. The utilities making these decisions are well equiped to look at the economics. The government can try to steer those utilities into some direction, like solar, but here in Texas solar has not caught on at all. The public utility commission tried to initiate a 500 MW goal for solar for some point in the future, I forget the target year. However there was such an uproar over the cost of the subsidy, the program was dropped. Right now we are learning that our open market energy based system is failing to provide sufficient generating capacity and may soon result in rolling blackouts. I will post an article in yesterday’s paper on this critical issue for us here in Texas. We are going to need a major overhaul of the regulations but the political leaders are just now realizing this. We need an overhaul of the regulations which when done, will allow generators to recover their capital costs. Since capital costs cannot be recovered in this current energy only market, coal, nuclear, and even solar are out of the question. That just leaves wind and gas and they are not a good marriage since wind eats into gas revenue and makes new gas capacity not economically viable. Those following this blog post might be interested in this recent article in The Hindu. Being an Indian perspective it pushes thorium bit the message is the same whatever the energy source. Some very interesting comments posted on the Oz site. I suspect they have been moderated. No green death threats :). MN thanks it sort of goes against the grain to subscribe to The Australian. I think the purchase of foreign offsets is looming like a national dentist visit with a growing sense of dread. Since whatever mysterious foreign CO2 decreasing processes underpin the offsets they probably aren’t new. So to make things worse we’ll have to pay for what we already get for free. I can’t see how an ALP government can live down any serious spending on overseas offsets. A victim of their own foolishness. I support carbon pricing BTW but not the present approach. For those who’ve looked at this report note that Table 2 gives the cost of foreign offsets to 2050 as $757 bn. I imagine some fabulously wealthy PNGians looking down over their forests knowing they can’t touch so much as a twig for fear of upsetting the paid-for carbon balance. Frankly the renewables + CCS + coal-offset-by-foreign-credits scenario is a fantasy in both political and real world terms . Shame on our Treasury Dept for peddling such shoddy work. The author has taken some Treasury numbers as a given so I’m not sure if this includes gas prices rising 2-3% a year as predicted by Santos. – what plausible energy mix will get us to 2050? – would you want to live in Australia in 2050?